Call parking is a feature that allows a user to place a call on hold on a specific VoIP device and continue the conversation from any other VoIP device. With this feature, you can quickly route a call to any extension. This feature can be accessed through Operator Panel system or directly from the device. 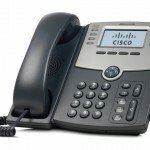 If you decide to use it directly from your VoIP device you just have to follow some simple steps. With the Operator Panel feature you can do this with one click. The parking queue is used to put on hold incoming calls that otherwise might fill an extra line on the operator terminal. Parked calls can be transferred to any extension or landline, cell phone or voicemail linked to a specific extension. 1. Click on the extension you wish to park. 2. Then click on the “Parking” button. Automotive Repair Shop – A customer calls the front desk asking for an update on his repairs but the employees in the service area are helping customers. If you transfer the call to an extension, it will probably go to voicemail causing customer frustration. With Call Park, you simply park the call, notify your service personnel which extension the call ia parked on, and who is available first picks up the parked call. Another happy customer! Call Parking feature can help take your business to the next level by improving communication and reducing customer frustration that can result from being transferred multiple times or sent to voicemail. Contact us today to find out more about VoiceMailTel’s Call Parking feature.